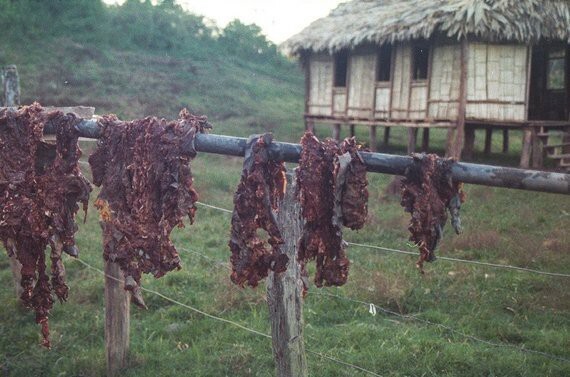 Armadillo drying in Tawahka village in rainforest of Honduras. Photo: David Wilkie/WCS. Today when families prepare a meal with meat almost anywhere on the planet, that meat comes from domesticated livestock. Only in the tropical forests of Africa, South America and Asia is the meat of wild animals still an important source of nutrition for millions of poor families. Since the term bushmeat was coined in the conservation community over 20 years ago, there has been growing concern that hunting wildlife for food in the tropics risks the loss of all large-bodied animals in the world’s remaining tropical forests. As most of these species are important dispersers of the seeds of forest trees and vines, this presents a long-term threat to forest health. 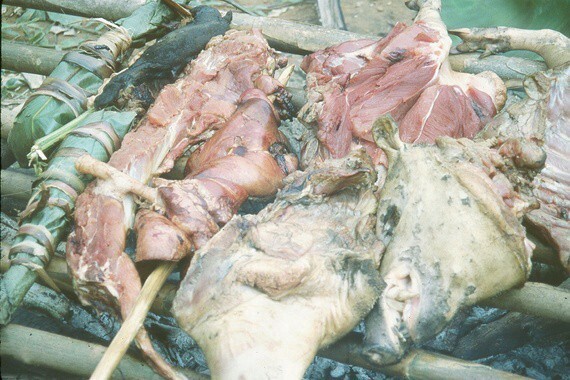 Even in places where local people are merely hunting to feed their families, there are good reasons to believe that bushmeat hunting may result in the loss of large-bodied species. Saatatu, an Efe bow hunter in northern Congo, rests on a hunt. It’s been five hours and he has caught nothing yet. Photo: David Wilke/WCS. I remember walking with Kebe and the other men of his camp deep in the Ituri rainforest of northeastern Democratic Republic of Congo. We moved quickly along one of many trails created by elephant traffic 120 feet below the forest canopy. We had been hunting for over seven hours and still not caught anything. Efe bow hunters like Kebe typically catch game on only one out of every three hunts. A blur of grey fur darted past us as a Gambian pouched rat raced across the fallen leaves and under a rotting log. Kebe ignored it and moved on. Another hour passed with no luck. Then, with a loud bleat, an antelope burst out from its resting spot in the buttress of a large mahogany tree. Before it could elude the Efe hunters, one of Kebe’s well-aimed arrows hit its mark. The men were elated. It was a yellow-backed duiker, perhaps 120 pounds, with more meat than the hunters’ had seen in weeks. Each man carried his share in a well-wrapped leaf parcel as we hurried back to camp. It was only four hours to sunset and with no moon the forest would soon be impenetrably dark. Roadside sale of spot-nosed guenon and Peter’s duiker in Northern Congo. Photo: David Wilkie/WCS. By following folks like Kebe, day after day, we know that hunting for today’s dinner is very different than hunting for recreation. 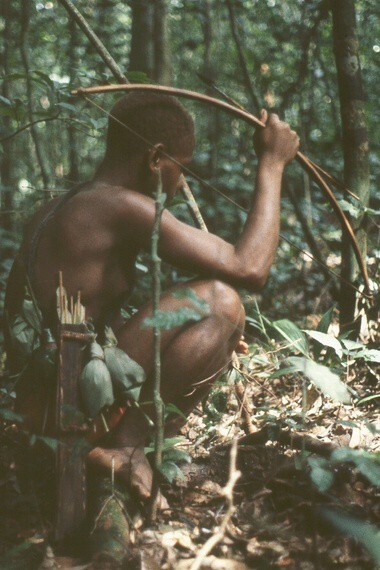 When we think of the latter, we envision someone intent on hunting a single species — a deer, a quail, a rabbit — and ignoring others she encounters that are not on her “target list.” Hunting for dinner in the forests of the tropics is hunting for bushmeat, nyama as Kebe would say. In Africa nyama is any wildlife species, from small rodents to elephants and everything in between. 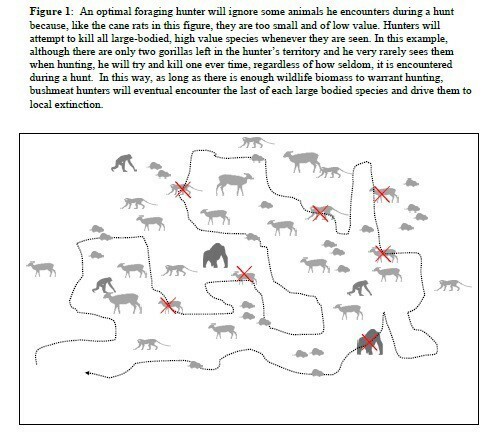 So why does it matter to the survival of species if you are a single-species or multi-species hunter? A hunter’s decision to go out hunting is in part determined by how much time he is willing to invest. As deer become fewer within an area, hunters must spend more time to bag their animal. After a certain scarcity threshold is reached, most recreational hunters will give up due to the low bang for their buck (or buck for their bang). 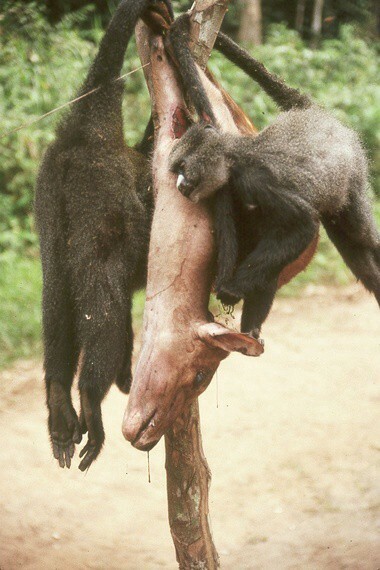 Bushmeat hunters, on the other hand, will continue as long as there are one or more species abundant enough to catch. For as long as humans have hunted for nyama, we have preferred large-bodied animals with a high ratio of nutritional value to capture cost (the time it takes to track and dispatch an animal). In fact, we will hunt these high value-to-cost-ratio species whenever they are encountered, and ignore other species. As high-ratio species grow scarce, lower ratio species enter the diet. We see this across the forested tropics (see Fig. 1 below). So what does this all mean? Both evidence and theory suggests that large-bodied species in tropical forests will be hunted out from areas where bushmeat species of all sizes remain sufficiently abundant to make hunting worthwhile, because hunters will try and kill a high value species whenever encountered, regardless how infrequently. That is the bad news. The good news is that we have at least one effective policy lever that can prevent the loss of large-bodied animals: The creation of protected areas. These needn’t be fortress-like national parks. Most can be modelled on the indigenous reserves of South America. Yasuni National Park and the Huaorani Indigenous Reserve in the Ecuadoran Amazon are vast, intact, highly biodiverse spaces. Both are lived in and hunted by Huaorani and Kichwa families. Though large-bodied animals are very scarce or absent close to settlements and within five kilometres of roads — as we would expect — the less hunted interior areas of the park and reserve still retain abundant populations of large-bodied animals such as peccaries, brocket deer, tapir and woolly monkeys. Though we are unlikely to change the way local people hunt for bushmeat, we can save large-bodied animals by creating protected areas large enough that hunting is common only in a few places and rare in most. In this way we can find a balance between meeting the nutritional needs of some of the poorest people on the planet and retaining the critically important ecological roles of wildlife. Originally published at www.huffingtonpost.com on June 11, 2014.